The largest domestic natural gas drilling boom in history has swept across the US. The Halliburton-developed drilling technology of "fracking," or hydraulic fracturing, has unlocked a "Saudi Arabia of natural gas" just beneath us. But is fracking safe? When filmmaker Josh Fox is asked to lease his land for drilling, he embarks on a cross-country odyssey uncovering a trail of secrets, lies and contamination. 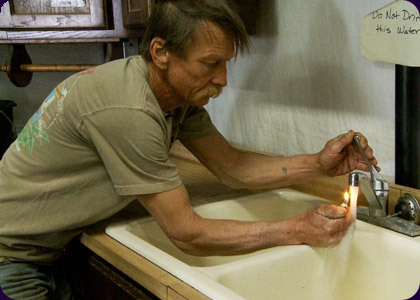 A recently-drilled nearby Pennsylvania town reports that residents are able to light their drinking water on fire. The resulting film is part verité travelogue, part exposé, part mystery, part bluegrass banjo meltdown and part showdown. Josh Fox is the founder and artistic director of the International WOW Company. His feature film debut Memorial Day (2008), a jarring roller coaster ride from the beaches of girls-gone-wild spring break to the torture chambers of Abu Ghraib, premiered at CineVegas Film Festival and went on to have a successful limited run at the IFC Center in New York. His recent work for the stage includes Surrender, an interactive war epic, which was nominated for a Drama Desk Award and Auto Da Fe, which premiered in New York and will tour to Japan in 2011. Molly Gandour is a Brooklyn-based filmmaker and writer. Molly has worked on arts programming with HBO Docs, and Emmy Award-winning programming with WNET/Thirteen, New York's flagship PBS station. She is currently in post-production on Yardsale '99, a narrative short film that she wrote, produced and directed. Trish Adlesic started out working on the pilot for the hit television show Law and Order. She continued to hone her craft working on feature films with esteemed directors such as Robert Benton, Sidney Lumet, Michael Mann, James L. Brooks, Gus Van Sant and Jim Sheridan as unit production manager, production supervisor and location manager. She has been working for the past ten years as a location manager for Law and Order: Special Victims Unit.